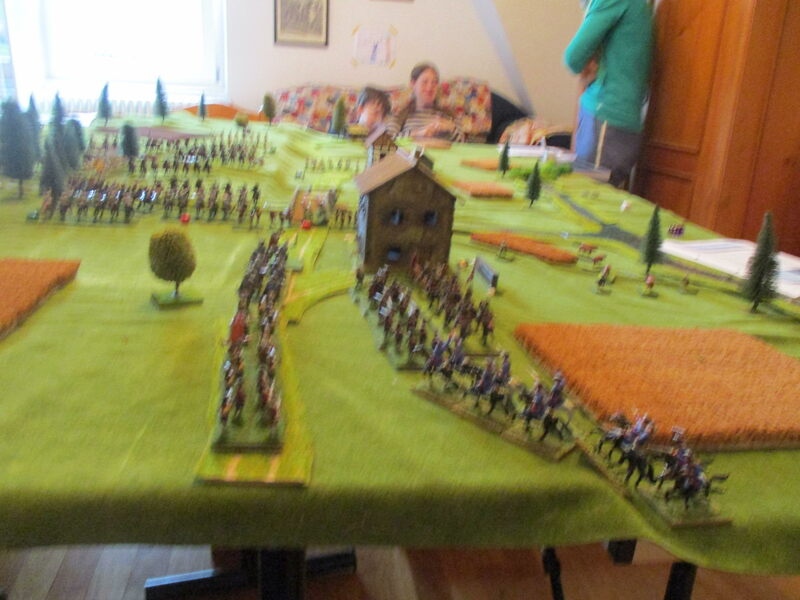 Yesterday I had the Chance to Play my own Scenario of the battle of Melle. I was Moltke, who had to fight his way to Ghent. 4) 2nd Group (Dep.) Brigadier "Bates"
Du Chayla had his troops in his camp. Could he block my attempt to break through his lines. I saw my best Chance in overwhelming the French before they could regroup their Units in a perfect line of battle. Not really a easy Task. I had all of my troops in column and had to deploy them in reach of French muskets. 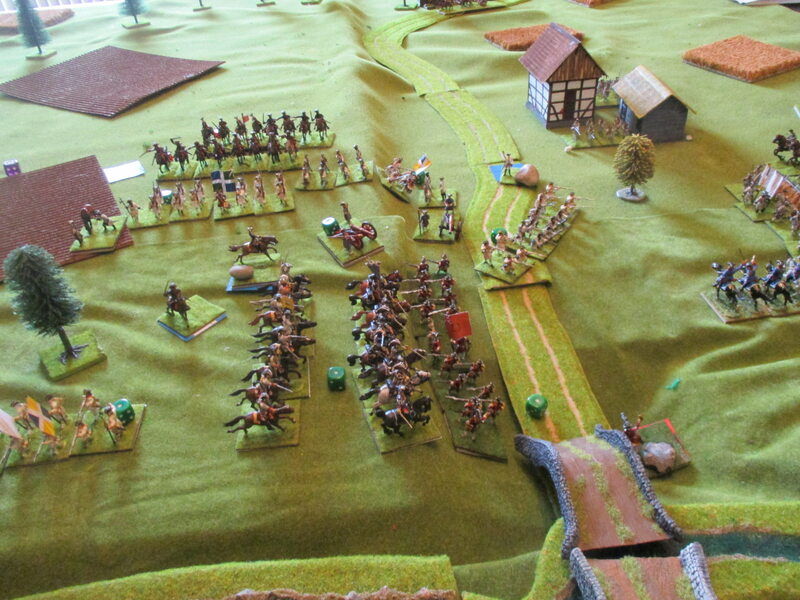 I had the hope to ignore the masses of French horse, concentrating all of my Units against Melle. My leading batallion deployed into line early enough to face off the first French batallion. But the second crushed in the redcoats. I had the misfortune that Rich's Dragoons stayed in Position to get volley after volley by one of Cirillion's batallions. I could send my hanoverian cavalry, 2 sqns strong, to attack a third bn. of Crillions Brigade, which tried to outflank the leading redcoats. 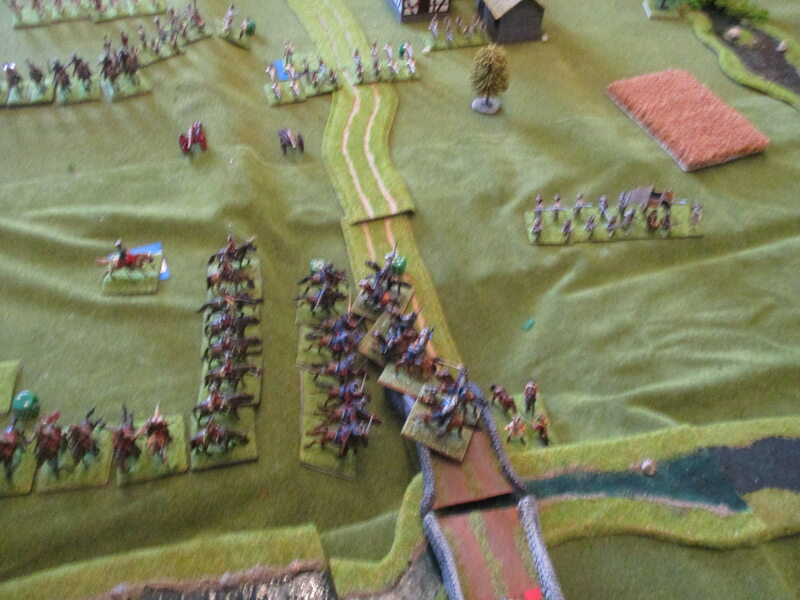 But Charleval had his riders right in Position to Charge my supporting unit. After Du Chayla had managed to stop my Avantgarde finally my reinforcements arrived. But the French had now all of their troops except Talleyrand's Brigade in place to attack me. 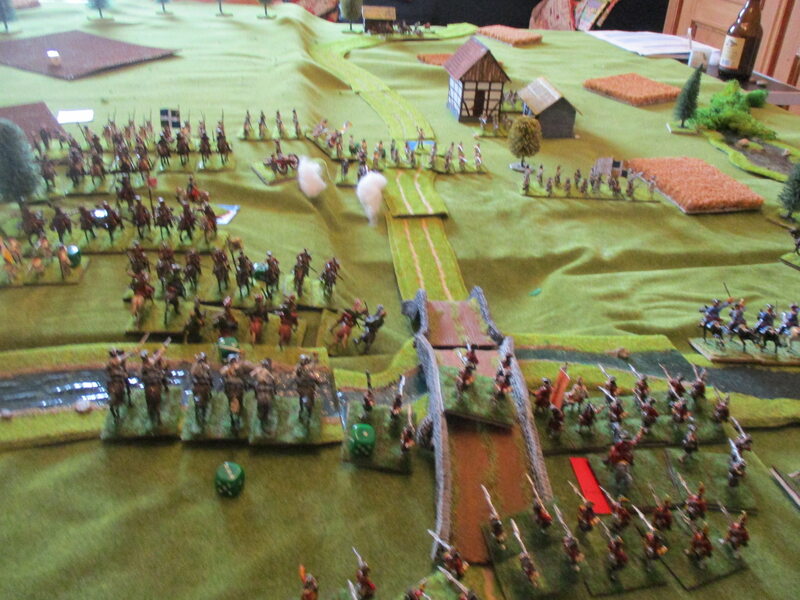 I gave up to use all of my brigades for the outflanking manoeuvre, but bring Bligh's Brigade Forward over the Bridge. I could'nt expect that the French would get a double move and they had the Chance to Charge Bligh's horse, which was still in column. Fortunately I could Change Formation. Both Units were destroyed. But Du Chayla could loose Units and I could not. 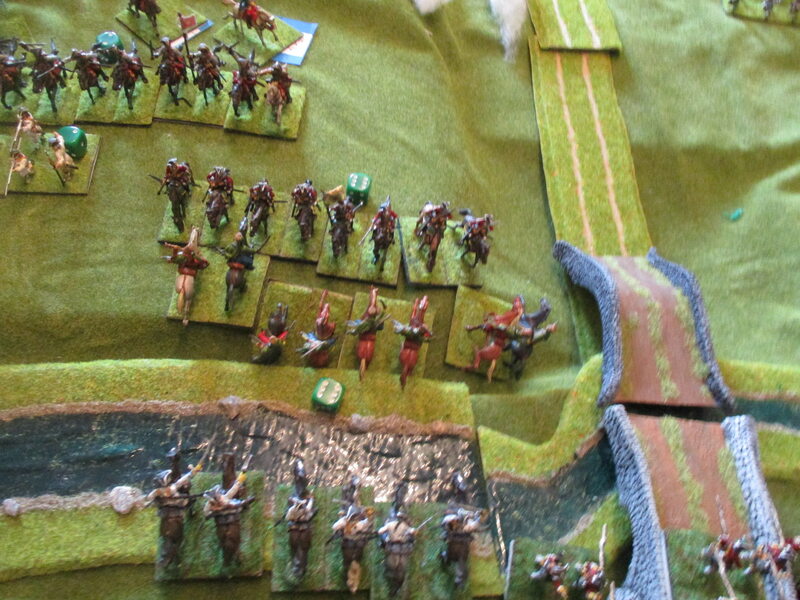 It was too good to don't use the Chance to attack the Pons-Cavalry in the flank. Pons could swing around and destroy my fine looking hussars. 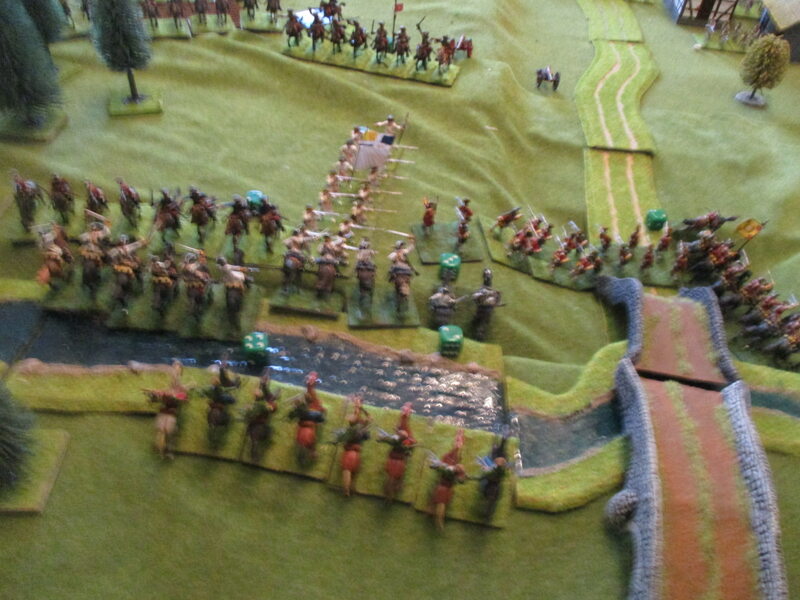 Brigadier "Bates" send both of his cavalryunits across the stream. At this time Bligh brought his last unit, his infantry, across the Bridge to prevent one of Cirillions bn.s from supporting his poor comrade. 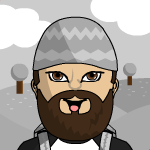 With some success the way would be free except the garrisson of Melle. Maybe the plan was very good, but I didn't counted with the French horse. Castries got a double move and wanted to drive his whole Brigade in the flank of Bligh's redcoats. Bligh's men could turn around and face the enemy. You can see - on the Picture above - how Bates' cavalry charged the poor bn. of Crillions Brigade in front of Melle. The French fusiliers were driven off. I decided to not pursue. 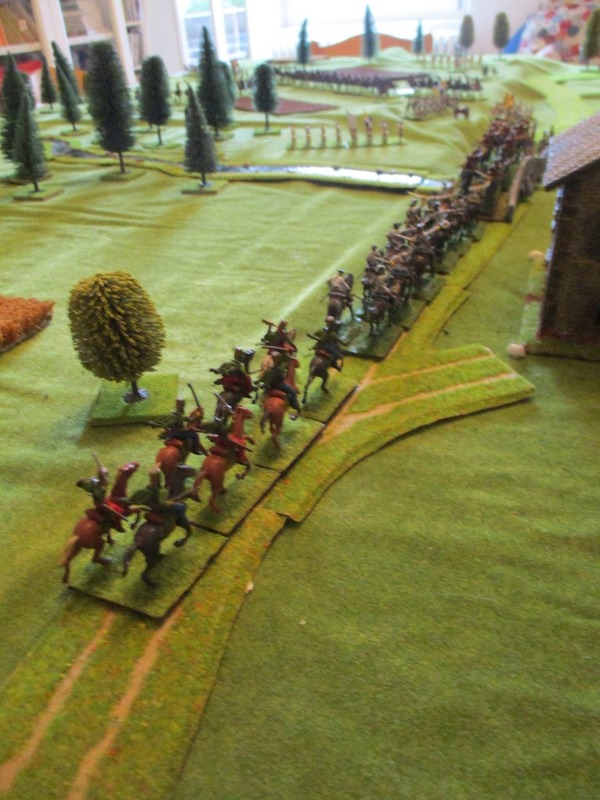 The Ligne-dragoons understood, but the dutch horse followed the retreating frenchmen. The dutch were welcomed with a volley, but could destroy the French bn. which ran into the just fled comrades behind them. So two bn.s of Crillion's Brigade were done fore in one turn. But I lost a bn. too and could not pay the Price. That ’s looking like a really good game. 3 bn.s destroyed and the French artillery now in place to shoot into my ranks. 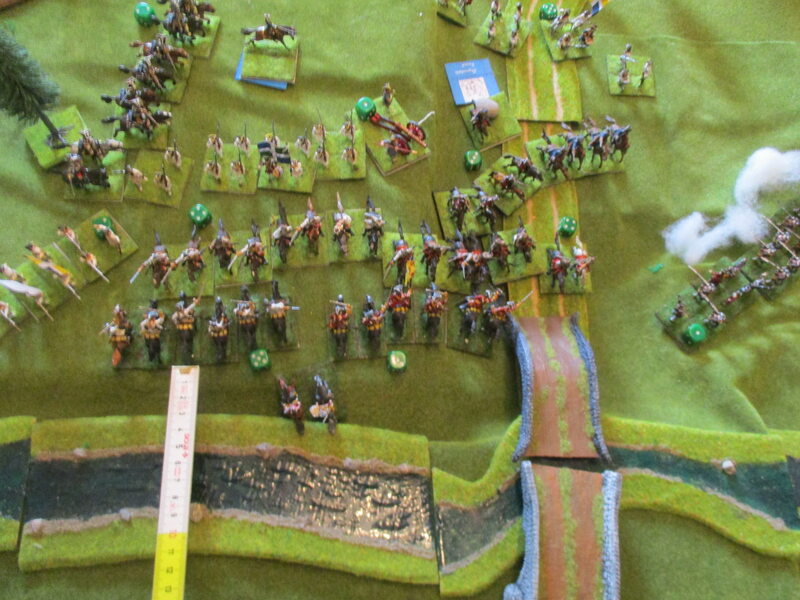 Now Bates has just 1 unit ready left, his Ligne-dragoons. Unfortunately the French garrison of Melle - the only Action of this bn. 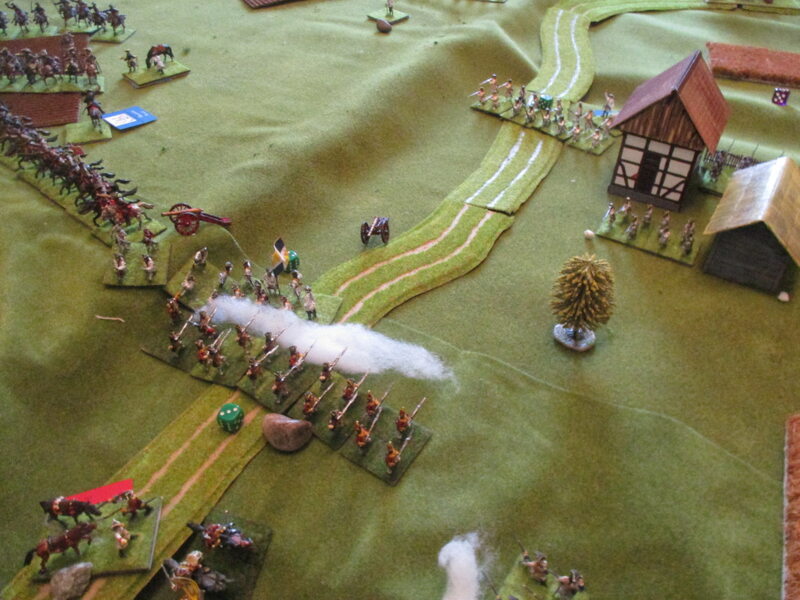 for the whole game - fires a very effective volley, which convinced the austrian dragoons to retreat. 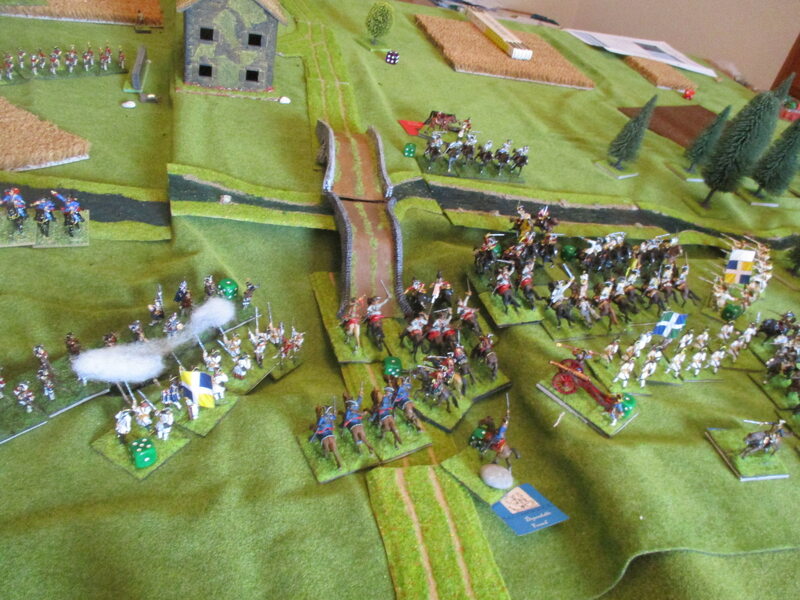 The retreating dragoons run into the dutch horse reforming. Perhaps I lost now my last Chance to break through on my way to Ghent. However the French losses were very high too and that gave me the Impression that the only Option was to advance and attack with every unit in range. Naturaly the arquebusiers de Grassin did me not the favor to stay and fight but continued in pulling back. 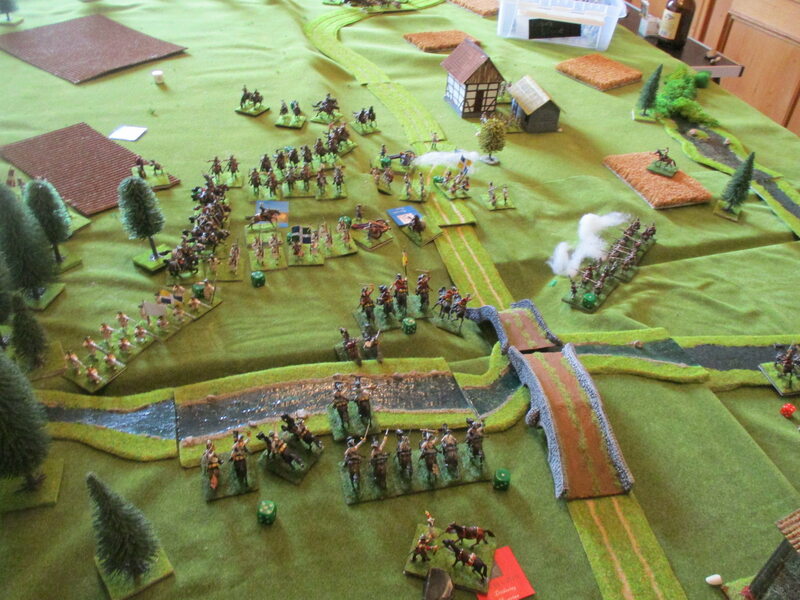 I saw no other Chance than to use one of my last batallions (the royal Scots) to follow this French light infantry, because I feared that they could kill my heavyly engaged cavalry Shooting them in their back. With halve of my infantry trying to achieve nothing, I advanced with the second bn.. 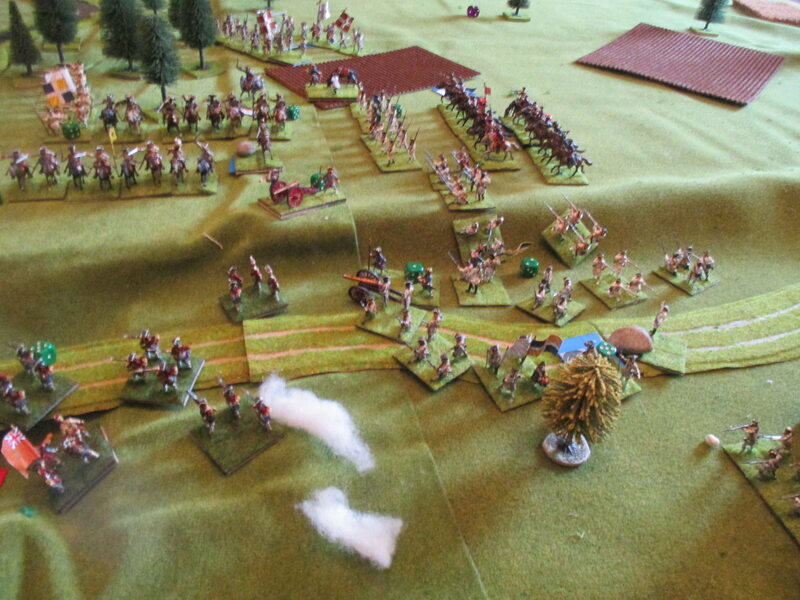 The French maybe thought that this is a good Chance for complete victory and charged Bates' redcoats, but their bn. was destroyed by fine british musketry. 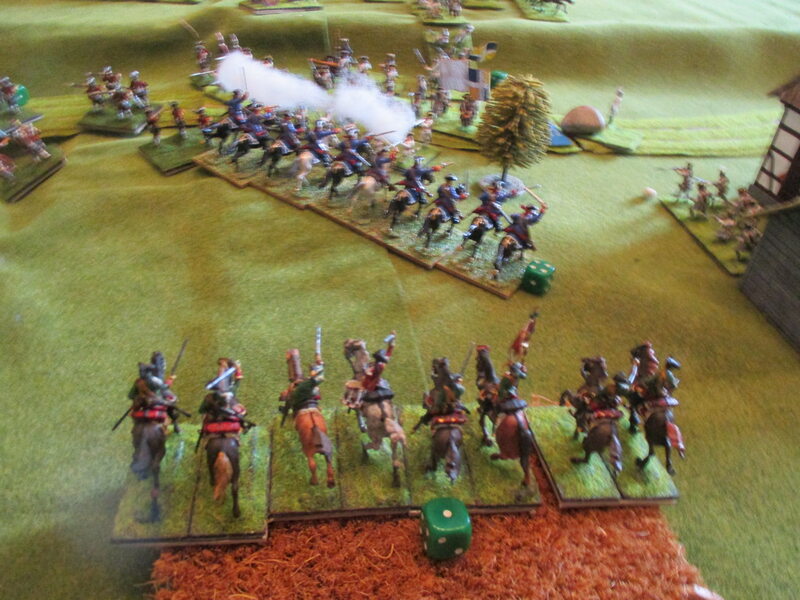 At the same time my Rich's dragoons launched their first Charge running into Mestre-de-Camp-cavalerie. And they finally restored the glory of British cavalry. The only misfortune was, that the hanoverian supporting unit was charged by Clermont-Tonerre-cavalerie. The Hand-to-Hand-fighting was short and brutal. 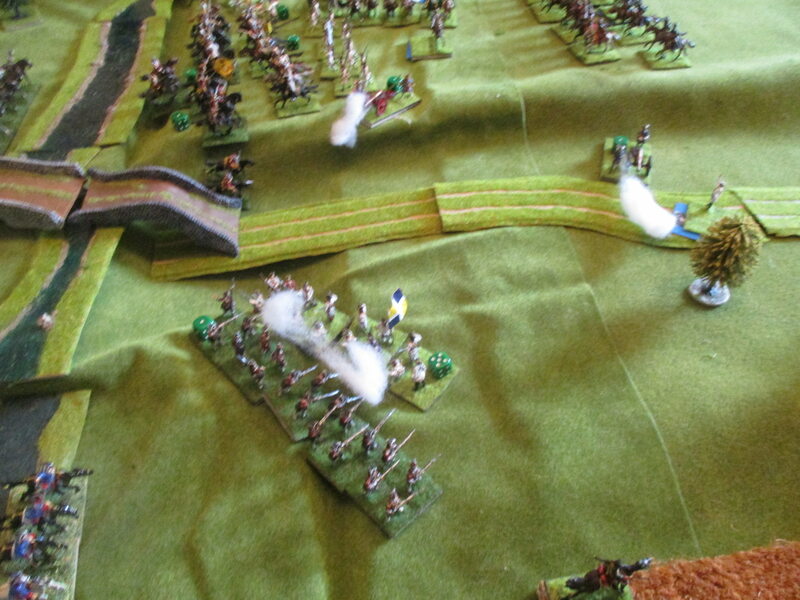 My hanoverians were done fore and the retreating Mestre-de-Camp-cav. run into the Regiment behind and that Regiment fled the field. So at least some success at last, but it was all too late. The French still had 2 Points left while I had just 1 Point left. In Points it was a draw. But in reality it was a strategic Major defeat. I coult not send my reinforcements to Ghent and although the French losses in the real battle was not so high like in ours, the result was nearly the same. After some struggles at the beginning, the French could use their numbers with success. A very interesting battle, not the typical linear one. It's really difficult to act with a dithering General in the sattle like von Moltke who did many faults in the real battle. 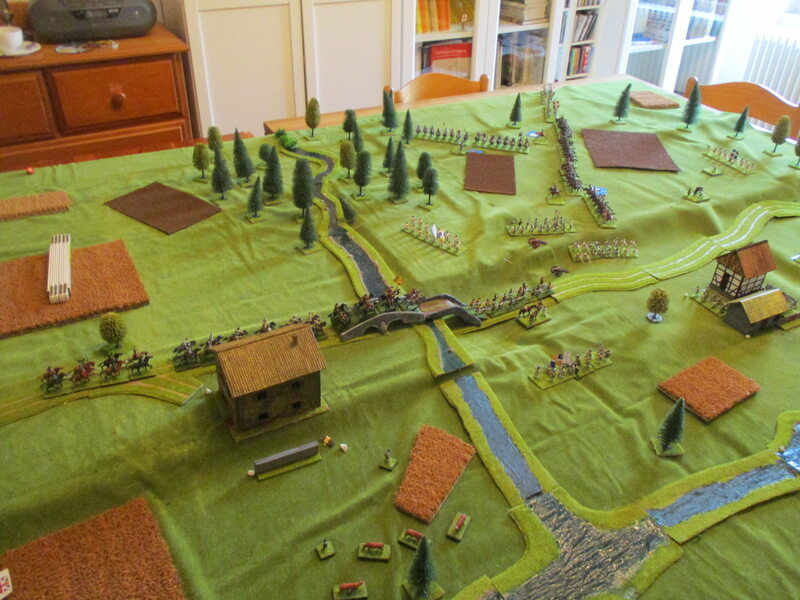 It's something new for me to Play a battle with nearly every unit of the real battle represented on the table. Some of my Units were just the right Units like the Leibregiment and Berry-cavalrie, what has his own nice touch. Hope you enjoy the account. I'm very pleased that you like it. The Forum became a bit silent since Keith don't plays HoW and Colin don't anounce his fine battlereports here (although I very much like his last Report about Prague). Your game is beginning to make me think that I ought to get some British troops to enable me to play a broader spectrum of battles. My main opponent has a French army and I can field Austrians. This scenario looks like a good one to base some British allies on. On the other tack a stick has been poked well and truly into the rules by some ‘gamers’ who appear to have no appreciation of either history or historical armies’ limitations. I would be interested in your thoughts on this in the rules thread. I would assume that you could use your Prussians for Krefeld for example. With 2 british and 2 hanoverian bn.s and some cavalry you could easiely field a propper small allied army for the WAS or SYW. I would recommend although to use perhaps your Prussians as Hessians and Dutch for the WAS. The Breeches and some details are different but it's hardly to notice in your scale. 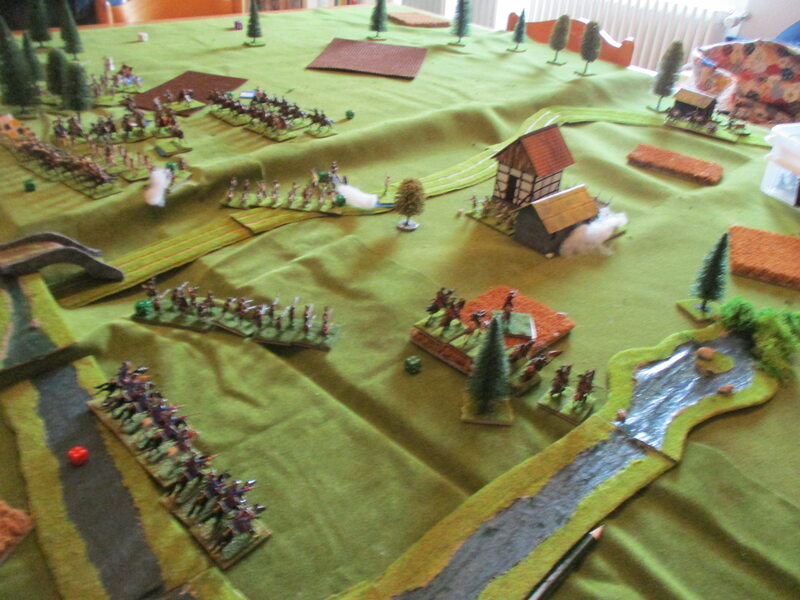 I use Prussians as Hessians too (the Hessian breeches were blue for example). Well I do have some Prussian garrison troops so they may well pass muster.